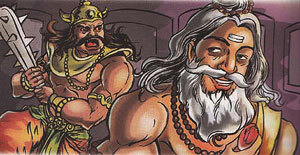 IIvala and Vatapi were two demon brothers who hated all Brahmins. They thought of a devious plan by which they killed many Brahmins. The first one could take any form, and the second knew the secret of bringing the dead to life. One day, they decided to kill the great sage, Agastya. They planned that IIvala would turn into a goat and Vatapi would kill it and offer it to Agastya to eat. Then using his powers he would bring him back to life. IIvala would tear Agastya's stomach to come out, killing Agastya. Sage Agastya came to know of the wicked plan and decided to teach the two brothers a lesson. When Vatapi invited him to eat the meat, he decided to teach them a lesson. Agastya ate the goat meat, but before the demon could bring his brother back to life, he digested the meat , killing IIvala.